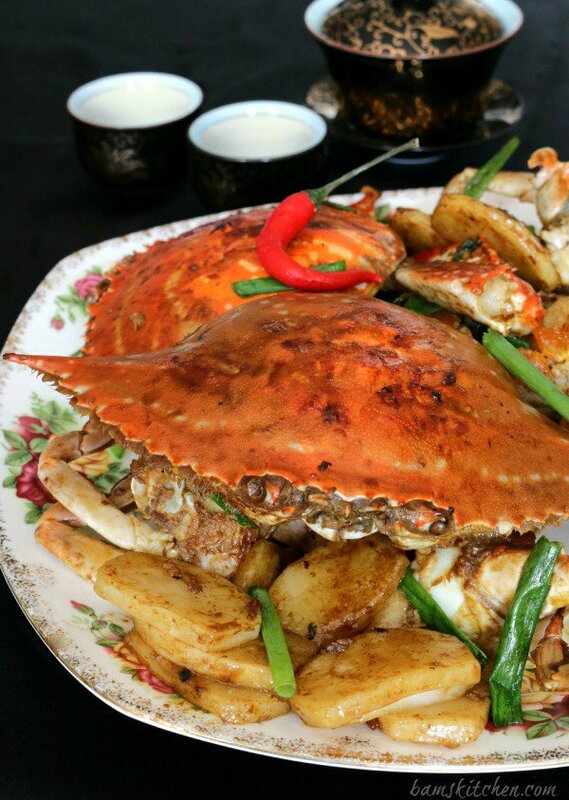 Sweet and succulent flower crab stir fried (Hua Xie Chao) with delicate herbs, spices and sticky glutinous rice Chinese New Year Cakes (Nian Gao). 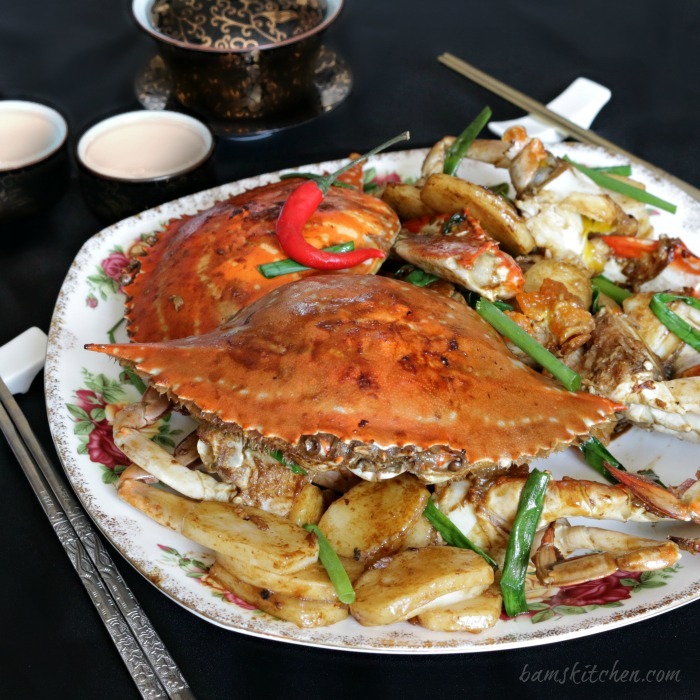 Stir Fried Crab with Chinese New Year Cake (花蟹炒年糕, Hua Xie Chao Nian Gao) is a very special dish to share with family and friends during the upcoming Lunar Year. 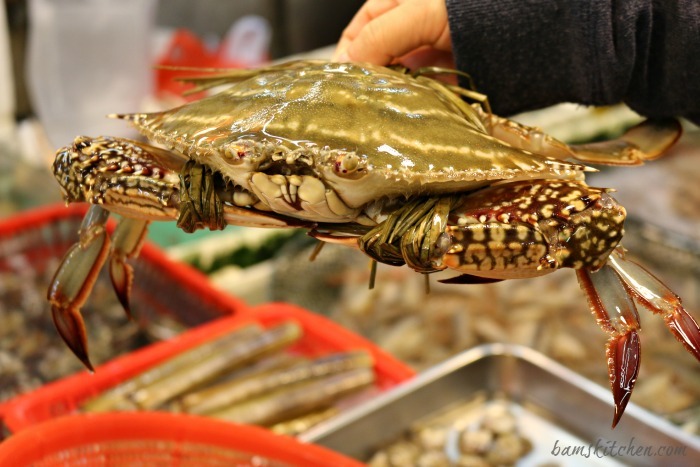 The flower crab (Hua Xie Chao) is sweet and turns a bright red/orange hue when it is stir fried in the wok. 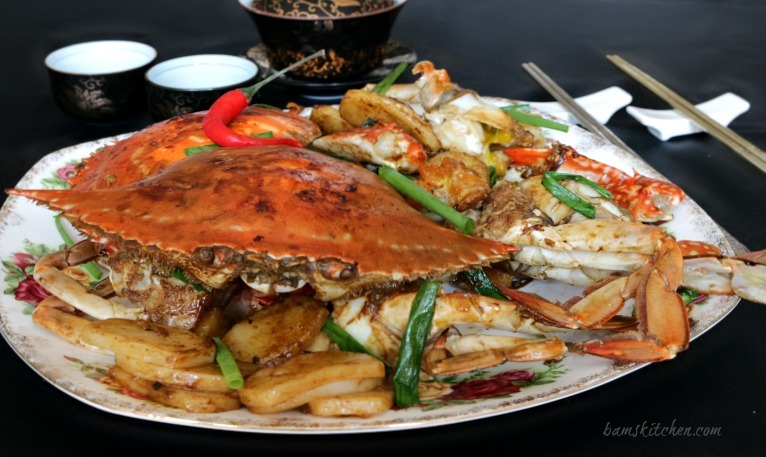 You have to do a little work to get to the succulent crab meat, but when you do, I promise that you are just going to love this Stir Fried Crab with Chinese New Year Cake dish. This might not be the best first date type of meal as there is not anything dainty about digging out crab meat with your chopsticks and sucking the end of the crab legs while the juice drips down your chin. 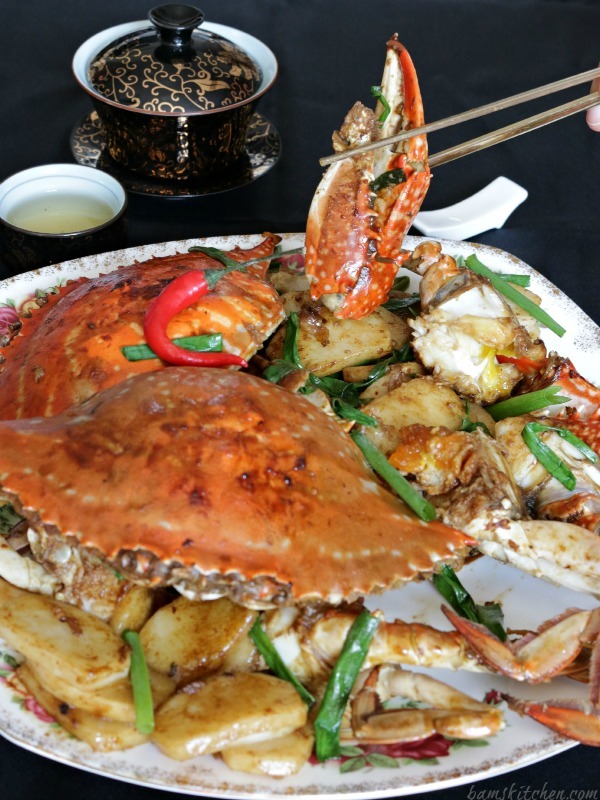 However, you are going to just love the delicate flavours of the ginger, garlic and sweet flower crab and this is the perfect meal to bring in the Chinese New Year (CNY). 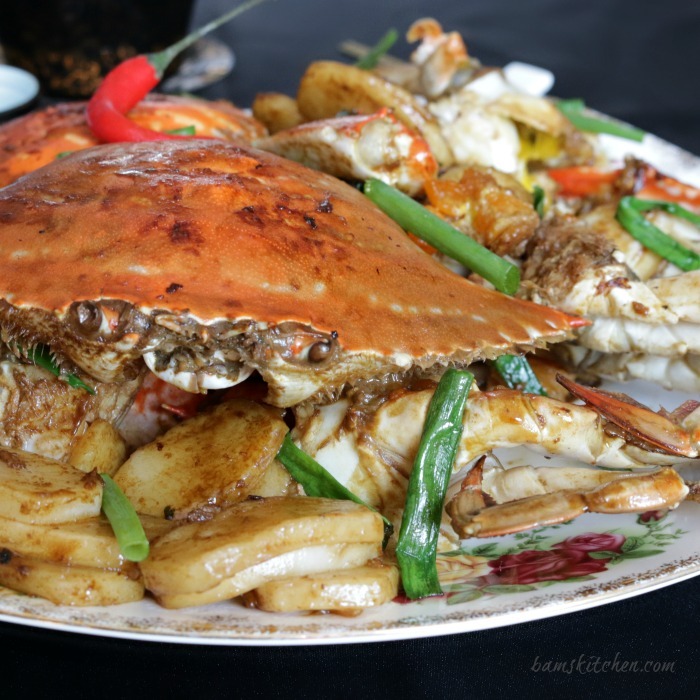 Stir fried crab with Chinese New Year cake (Hua Xie Chao Nian Gao) is a special dish from the Zhe Jiang Province that my dear friend, Safie, is from. I asked her what dish do you want to make together to celebrate the New Year. She immediately responded with Hua Xie Chao Nian Gao as it is something that reminds her of the warm memories of being home for the holidays. With a good plan in place, we went to the wet market to gather our supplies. The first thing on our grocery list was the The New Years cake (Nian Gao in Mandarin or Nian Gou in Cantonese). 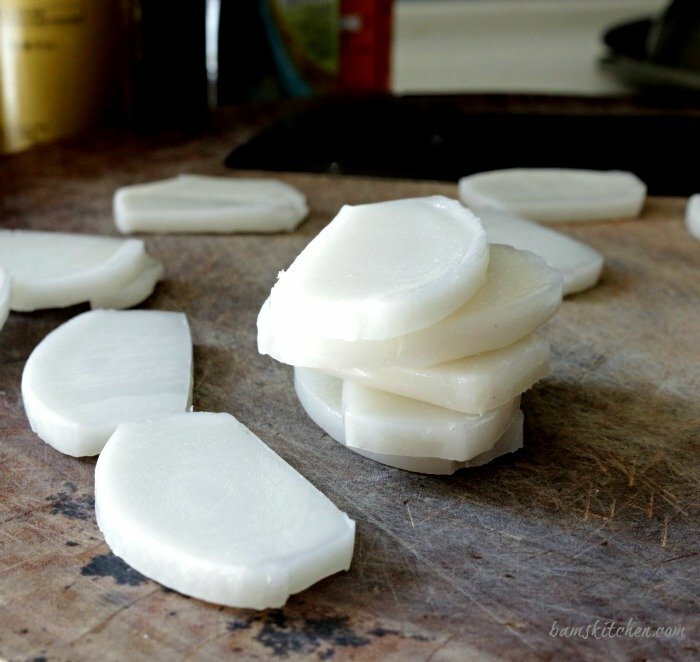 Nian Gao are chewy little rice cakes made of glutinous rice flour that is pounded to different shapes and sizes and add a nice texture to this dish. Nian Gao is a very popular recipe item during the Chinese New Year as “Nian” means year and “gao” means high. This loosely translates to “every year, may you reach higher and higher.” Nian Gao is a very common dish served during the Chinese New Year for good luck and to be prosperous in the upcoming New Year. The Chinese New Year (Lunar Year or Spring Festival) will be celebrated starting on Feb 19th, 2015 of this year. New Year cakes come in many shapes and sizes and colours and additions depending on which China province you live in. My dear sweet friend, Safie, is from the province of Zhe Jiang and city of Wen Zhou. In her hometown, they have a very special Nian Gao that has wild Chinese herbs in it and is slightly red/beige colour. Nian gao has a very chewy and sticky texture that just makes your mouth want to go back for more. They are like a really fun textured rice noodle. They can be used in both savoury and sweet Chinese dishes. I would have loved to make this dish using her hometown's Nian Gao but it would be very difficult for you to find this in your country or even in Hong Kong. Here is the little Chef, Safie! Please extend a warm hello and a thank you to Safie for bringing us this recipe and the history behind this special dish. Instead, we have made this Stir Fried Crab with Chinese New Year Cake dish with your basic run of the mill Chinese dried rice cake that can be found in the noodle section of a grocery store or sometimes can also be found fresh in the refrigerator section. We used the brand Ng Fun Bran, 500 grams rice cakes in the noodles section of a local Park n Shop here in Hong Kong. 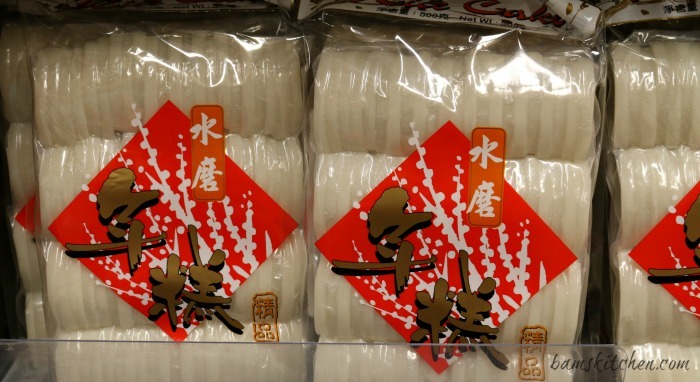 Chinese rice cakes are a bit different in taste and texture from the Korean dduk (Tteok). However, if that is all you can find you can slice the cylinder shaped Korean dduk or find them in disks in the refrigerated section. If you can obtain your special Nian Goa from your hometown, then just slice and add to the recipe and it would be even better. In order for the delicious crab meat and roe to permeate the dish you need to cut up and prepare the live crab. Now, this is the part that I get a bit squeamish about and so glad that the sweet little fish monger offered to clean up, remove the lungs and chop up the crab into sections. Bless her, as I never have the heart to kill anything still moving. 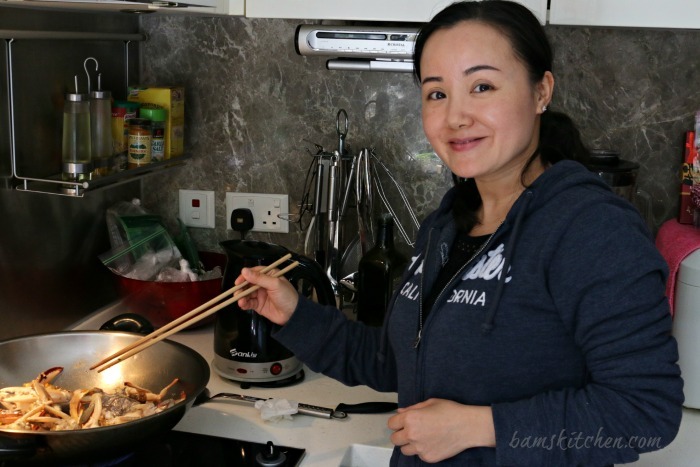 When we first moved to Hong Kong, my husband brought home 2 live fish and gave them to me. He wanted me to prepare Cantonese steamed fish. I filled the kitchen sink with water and let the fish swim and asked him if we should buy an aquarium. Since then, I have over come many of my fears. 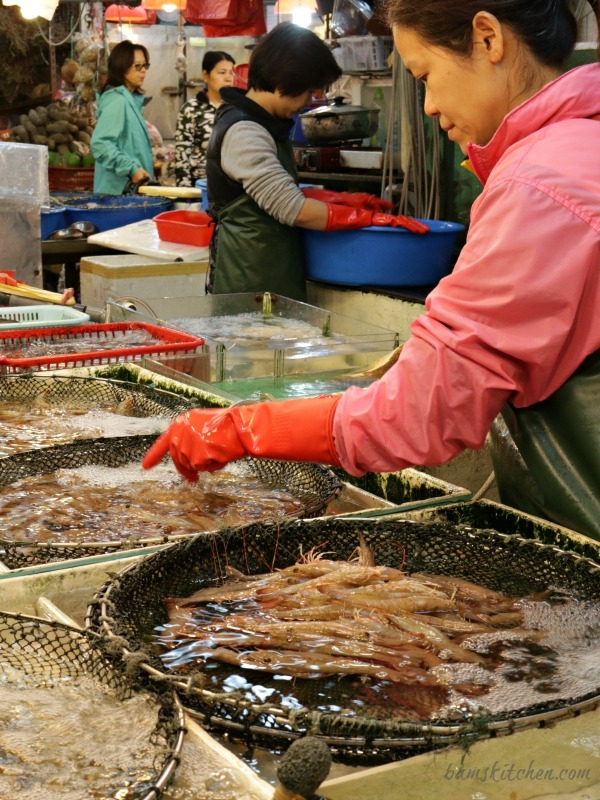 One trick that I have learned is to ask the fish monger to prepare the fish or seafood as you wish before you leave the wet market and if all else falls ask for extra ice. Ice works to freeze and paralyse the fish/seafood so that they are kind of sleeping before you prepare them. The other items on our grocery list such as cornstarch, ginger, green onions light and dark soya sauce, sugar and Shaoxing wine are standard items in any Chinese Kitchen. Light soya sauce gives it a slightly salty favour. The dark sauce gives it a pretty colour. If you want to keep this dish gluten-free, then just use tamari sauce instead of soy sauce. The Shaoxing wine, ginger, garlic and green onions are the aromatics in this very special dish. The crab and sugar give it sweetness. The nian gao gives it its fun texture and slight sweetness. As the Chinese New Year is a very special celebration, Stir Fried Crab with Chinese New Years Cake would traditionally be served with a very special aged Shaoxing wine (niu er hong). Shaoxing wine is fermented rice wine. It is usually made in the region of Shaoxing and in the province of Zhejiang so that is why it is called Shaoxing wine. Niu er hong (translates as daughter red) and is usually made by the father and he buries this aged Shaoxing wine under the ground until his daughter is married. When his daughter marries, he digs up the special aged Shaoxing wine and they enjoy with the wedding celebration. This special "aged Shaoxing wine" is not to used in making the Stir Fried Crab with Chinese New Years Cake but instead to be enjoyed with the meal. The younger Shaoxing wines can be used for the purpose of cooking. You can purchase Shaoxing wine in any Asian grocery store and you can exchange for cooking sherry if you cannot find this product. Wishing everyone a very safe and happy Chinese New Year and I hope you enjoy this delicious Stir Fried Crab with Chinese New Years Cake as a part of your CNY tradition. 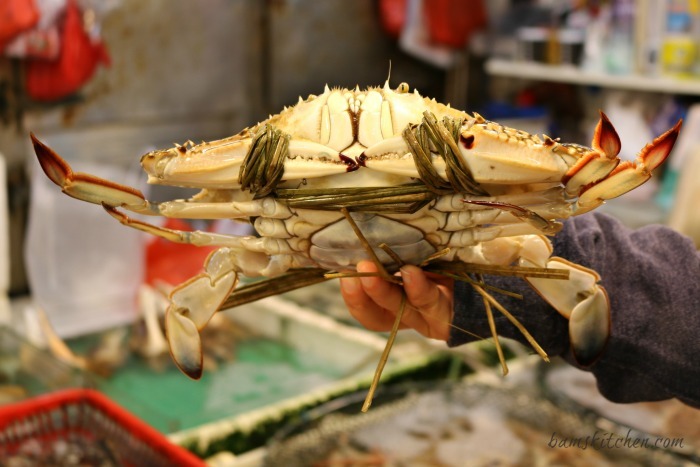 crabs - 2 live Asian flower crabs (Hua Xie) female hard shell crabs with lots of roe are best. cornstarch - 1-2 tablespoons to coat the the ends of the crab and to prevent crab from coming out of shell and to help thicken the sauce. 1Ask your fish monger to quarter the crab and remove the lungs. Alternatively if you bring home a live crab, then place crab in lots of ice to help sedate the crab before stunning, quartering the crab and removing the lungs and main shell (called the carapace) Keep the main shell (carapace) whole but quarter the leg sections. 2Rinse your Sticky Chinese New Year rice cakes. Do not soak or otherwise they get too sticky. Set aside. 3Dip the ends of the cut crab in cornstarch. this helps prevent the meat from falling out during the cooking process and also helps thicken the sauce. 4Place oil in wok and add ginger, garlic and the white end of the green onion (bash the white parts of the green onion with the back of clever) and fry until aromatic. 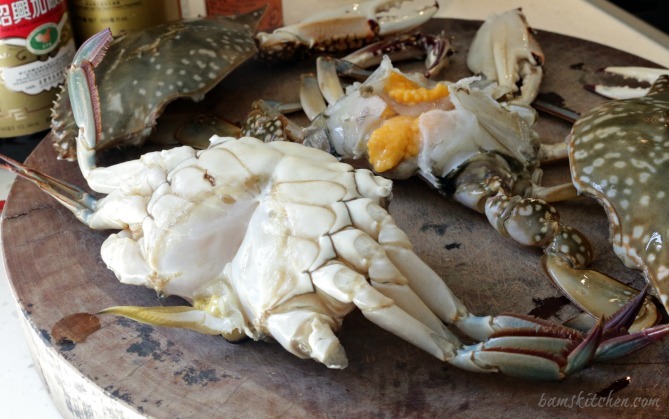 Add all of your crab quarters, main top shell and legs and stir fry for 3-4 minutes or until crab shells turn red. 5Add the Shaoxing wine, Tamari (light soy sauce) and dark soy sauce to taste, sugar, rice cakes and water. Stir fry for 1 minute and then cover for about 2 additional minutes or until rice cakes are tender and most of the liquid is absorbed. 6Add the green part of the scallions and stir into mixture, adjust seasonings as needed and serve. Enjoy!